Bulk SMS Malaysia | Monthly Report - lowest price & most reliable Bulk SMS marketing tool, 2 way sms Malaysia, works with Bulk SMS Singapore, online sms solution, web sms marketing. 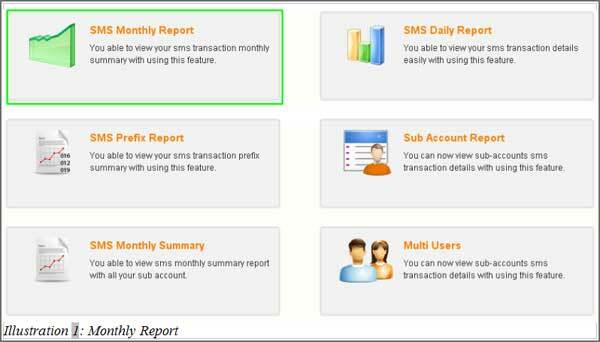 You will be able to view your monthly report by click on "SMS Monthly Report". After click on it, you will able to view as picture shown below. After selecting "Manage SMS Route", a list will appear as the picture shown below. You can change the year view by selecting the option bar above the charts. This chart will show your total sms that has been sent, how much has been charged, how many sms have successfully sent, how many message is using UTF-8 or ASCII and which is send from SMS API or send from site. In addition to that, it will just show out the month user used. For example, this account starts on June 2013 which mean it will show from June till current month.